Where do you go at Christmas time that it wouldn’t be Christmas if you didn’t get there? For a number of years, my answer has been….The Carolina Inn. I first stayed at the Inn in 1992 when visiting Chapel Hill, NC. It is a quintessentially southern experience, gracious and welcoming. The hotel was built in 1924 by UNC alumnus John Sprunt Hill, a major benefactor of the university and designed by award-winning architect Arthur C. Nash, who designed a number of other university landmarks. Hill gifted the hotel in 1935 to the university. 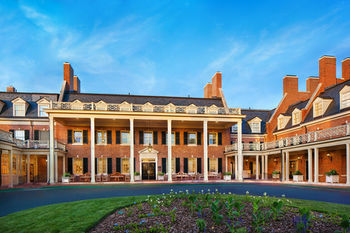 The Carolina Inn is architecturally significant, blending elements of antebellum Southern plantation homes with Georgian and neoclassical features. The building’s original front was modeled after George Washington’s home at Mt. Vernon on the Potomac River. Nash’s design brought to fruition Hill’s dream of an inn that resembled Mount Vernon with its long portico, cupola, and roof balustrade. The inn continues to serve as a meeting place and hostelry for friends of the university and a destination for guests who check in and stay awhile. 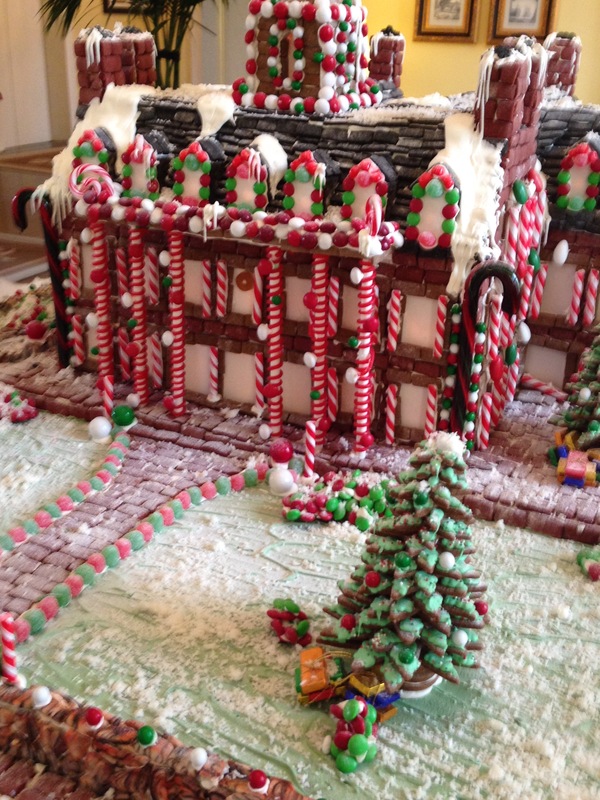 This photo is a gingerbread-house version of The Carolina Inn. Throughout December, The Inn is decorated with The Twelve Days of Christmas including two turtle doves in a birdcage. A beautiful Christmas tree welcomes you in the stunning lobby. If you want to experience a gracious southern lifestyle, I recommend time at the Inn. PS: When I wrote the novel, Facing East, it comes complete with a scene set at the Inn. This entry was posted in A to Z Blog Challenge April 2016. Bookmark the permalink. You said a meeting place for friends of the university. Does this mean it is no longer a place to stay for others? Thanks for catching that it was unclear. The Inn is booked with over night guests too. You are off to a great start on your A-Z challenge. So much work you have put into it. We have grand memories of meals at the Inn and loved strolling through the gardens there. Looking forward to the rest of the challenge. wow- what a lovely place! Oh wow – that is one hell of a facade! A wonderful building! It seems to be surrounded by a parc / a garden?! Carolina Inn is one of UNC’s crown jewels. My daughter was married in the courtyard–such a lovely place. I never got to Chapel Hill in all the time I spent in the Raleigh-Durham area. Kind of a shame I didn’t. This place looks gorgeous. Interesting. I’d not considered going anywhere other than home for Christmas. Sounds like a beautiful place to spend the holiday though. I love seeing your choices for the A to Z. You have beautiful photos to go along with your informative posts. This is a beautiful place. I’ll put it on my “places to go” list. Love your theme and will be back for more! Looks like a lovely place to visit, especially at Christmas. I never stayed here, but I did live next door for four years in the dorm Whitehead! The next time you visit Chapel Hill, which I hope is possible, you can put the Inn on your to do list. It is under new management and their are changes being made. My prayer is that it retains its heritage. Beautiful! I can only imagine how delightful it must be at Christmas. Lovely vignettes scattered throughout the inn of the 12 days of Christmas. Wish I could show them to you. One of my favorite places for dinner, lunch or just a drink. Christmas is wondrous there. I do miss the old cafeteria where the wall sculpture of the circus and its animals were displayed (now in the Alumni Center) – great Southern food for breakfast and a place to gather with fellow faculty. This is where we must meet next time…there is time! I’m holding my breath because I have been told that the dining room has been redone. How will I manage without the yellow painted walls and blue toll de joy fabric, if this is so. A beautiful afternoon here in North Carolina. A perfect day to enjoy a place like this. We actually ate a Thanksgiving Dinner at Mt. Vernon, so this is my kind of place for the holidays! Nicely done. The Inn is a jewell in Chapel Hill with a long story of young people and their parents enjoying a southern moment.